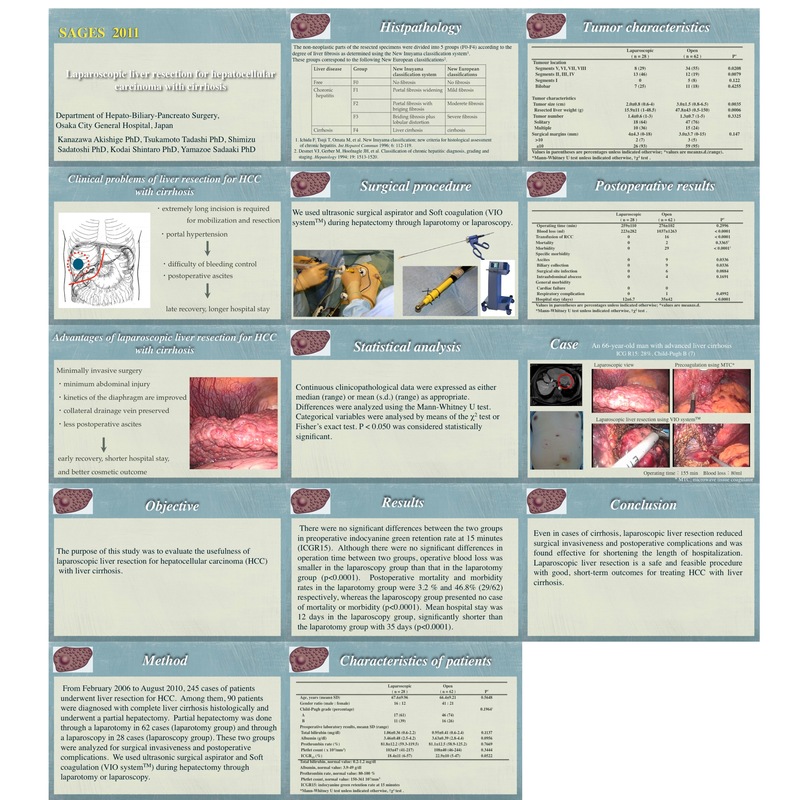 Objective: The purpose of this study was to evaluate the usefulness of laparoscopic liver resection for hepatocellular carcinoma (HCC) with liver cirrhosis. Background: Liver resection for HCC in cirrhotic patients sometimes involves difficulty in controlling perioperative hemorrhage or postoperative intractable ascites, which often result in a longer hospital stay. With improvements in technology and equipment, laparoscopic liver resection is now considered a safe procedure even in the management of liver tumor if performed by experienced surgeons. However, it is unknown whether laparoscopic liver resection of HCC is suitable for cirrhotic patient. Method: From February 2006 to August 2010, 245 cases of patients underwent liver resection for HCC. Among them, 80 patients were diagnosed with complete liver cirrhosis histologically and underwent a partial hepatectomy. Partial hepatectomy was done through a laparotomy in 62 cases (laparotomy group) and through a laparoscopy in 28 cases (laparoscopy group). The two groups were analyzed for surgical invasiveness and postoperative complications. We used ultrasonic surgical aspirator and soft coagulation (VIO systemTM) during hepatectomy through laparotomy or laparoscopy. Results: There were no significant differences between the two groups in preoperative indocyanine green retention rate at 15 minutes (ICGR15). Although there were no significant difference in operation time between the two groups, operative blood loss was smaller in the laparoscopy group than that in the laparotomy group (p<0.0001). Postoperative mortality and morbidity rates in the laparotomy group were 3.2 % and 46.8% (29/62) respectively, whereas the laparoscopy group presented no case of mortality or morbidity (p<0.0001). Mean hospital stay was 11 days in the laparoscopy group, significantly shorter than the laparotomy group with 22 days (p<0.0001). Conclusion: Even in cases of cirrhosis, laparoscopic liver resection reduced surgical invasiveness and postoperative complications and was found effective for shortening the length of hospitalization. Laparoscopic liver resection is a safe and feasible procedure with good, short-term outcomes for treating patients with HCC with liver cirrhosis.